Foods: Paxton Inn: Seated dining- Transparent puddings, traditional foods & KY Burgoo, Venison stew, soups, and sandwiches. Homemade desserts. Albert Sidney Johnston Antebellum C. 1797 Museum- 507 South Court Street will serve hot cider & cookies. 1796 The William Goforth House, 1934 Old Main St.: Open to public noon to 5:00 pm. New work by artist-in-residence, Ken Swinson & FREE print make your own Christmas card on traditional printing press. Bluegrass Artisans Center in the Canebrake, Pre-1790 Log Cabin – Featuring: A Frontier School Room History Exhibit & prints of historic buildings in Washington by Ken Swinson. Claudia Moose will help with print demonstration. Mike Cowden, Curator. residence, Ken Swinson. A FREE educational print making activity. residence, Ken Swinson. A FREE educational print making activity..
3:00 – 4:00 Caroling throughout the village and shops. 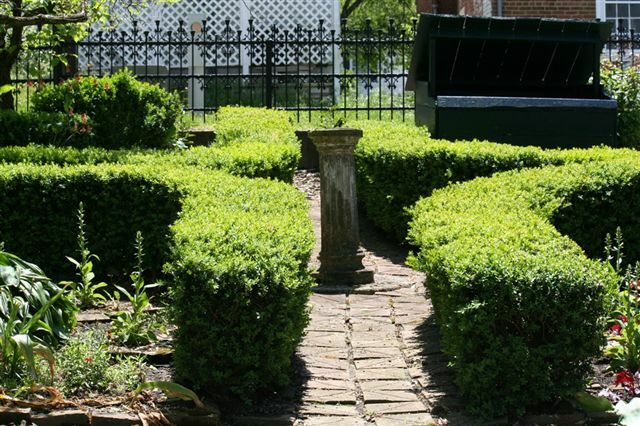 Washington, KY, (now Historic District of Maysville, KY) – 1700’s village of log cabins, museums, guided tours, Special Events, flagstone streets with a variety of antique, craft and specialty shops, tavern dining. Washington is nestled 4 miles south of the banks of the banks of the Ohio River and Maysville on US 68, 50 miles west of Portsmouth, Ohio, and 51 miles east of Cincinnati, OH, (take the Wilder Exit, #77 off I-275 onto Rte. #9 – also known as the AA Highway), then turn right at the light by Wendy’s onto US 68, turn left at third light up into Washington. Washington is 1 mile south of AA Hwy on US 62 (formerly US 68). Washington has these events for 2015. 12th Annual 400 Mile Yard Sale – June 4-7, 2015 – Thursday thru Sunday. This 4-day celebration has grown by leaps and bounds each year. Crews from Great American Country Television (GAC-TV) will be filming in Washington for their series ”Endless Yard Sale”. "Pioneer Day in Old Washington"
39th Annual Simon Kenton Festival – Always 3rd weekend in September. This year September 19-20, 2015. Bake Sale - New Beginnings Church 11:00 Sat. Albert Sidney Johnston Antebellum C. 1797 Museum- 507 South Court Street will serve hot cider and cookies..
1796 The William Goforth House, 1934 Old Main St.: Open to public noon to 5:00 pm both days. Prints and paintings by artist-in-residence, Ken Swinson. Ken is offering a FREE educational printmaking activity. Bluegrass Artisans Center in the Canebrake, Pre-1790 Log Cabin – Featuring: Claudia Moose, Greenery- Floral Holiday Decorating; Paintings by Sue Gorman and Rob Weingartner, and traditional block prints of Old Washington’s historic buildings by Ken Swinson. Mike Cowden, Curator and Artist. residence, Ken Swinson displayed. A FREE educational print making activity. 12:00 - 4:00 Ohio River Minstrels – John & Gwenn Noftsger – Strolling musicians on street. Chocolate Festival have been discontinued. May - "Garden Day" - May 11, 2013 - From 10 a.m. until 5 p.m.
for sale at Washington on May 11 during "Garden Day". See pictures below of some of the 8 Gardens on Free Tour in 2012 below. Different Artists - Including Robbin Lee Weingartner, Silversmith most weekends. Sale starts in Maysville, Washington, May's Lick and work their way westward across Kentucky. If one starts at the other end in Paris Tennessee and travels north on Hwy 641 through Puryear TN, Hazel KY and Murray before connecting to Hwy 68 at Aurora via Hwy 80 heading north to Sharpe & Reidland or east all the way to Mayville. In 2012 around 180 Fifth-graders from Mason County Intermediate School who participated. The day began at 8:15 a.m..
oxen, medicine and guns from the pioneer era. Two men portraying members of the Lewis and Clark Expedition had a booth featuring various medicines and guns used by the members when they passed through Washington. The day concluded with a walking tour of the many historic building in the village. the this event each year. The majority of people involved in this are volunteers. The event could not take place without them. Frontier Christmas – Dec. 7-8, 2013 (46th Annual Event) Celebrate and old fashion Christmas - Quilting, Weaving, Candle Dipping, Handmade gifts, Banjo, Dulcimer, Fiddle, Bagpiper, Strolling costumed Carolers, Kris Kringle, and Much More. 7Another award winning festival welcomes in the holiday season in our scenic village. 7 museums with holly decked mantles, pine-scented rooms and candle-lit windows, and craft demonstrations. A different full production play is performed several times each year at the Presbyterian Church. Tickets are free, but needed as old 1870 church only holds 200. Vesper Service at Old Church Museum Sunday afternoon at 4:00. Shops offer a wide variety of Christmas items. Many vendors come to fill every nook and cranny - Vendor Spaces are limited, so please submit your registration early. Payment by check only, made payable to Old Washington, Inc.
“Pottery on the Lawn” - Every Saturday and Sunday in August 2012 from Noon to 5 p.m. Traditional old pottery wheel demonstrations. All Potters welcome to come set up and sell their wares. Rob Weingartner, Silversmith: At Bluegrass Artisan Center – 2215 Old Main Street most every Saturday and Sunday. starts this Thursday May 31st – June 3rd! Our Governor delivered as promised! The bridge across Kentucky Lake opened last Friday at 1:00, with just 6 days to spare before the huge 400 Mile Sale across Kentucky! One can now take Hwy 68 all the way across Kentucky, reconnecting Aurora to Cadiz just in time for the 400 Mile Sale! ROUTE HAS NOW EXPANDED! 400 Miles was just not enough! 400 Miles was just not enough so the Sale now starts at Maysville, Washington, May's Lick and work their way westward across Kentucky. If one starts at the other end in Paris Tennessee and travels north on Hwy 641 through Puryear TN, Hazel KY and Murray before connecting to Hwy 68 at Aurora via Hwy 80 heading north to Sharpe & Reidland or east all the way to Mayville. Or they can start in the middle in Bowling Green or anywhere in between. SALES WILL BE EVERYWHERE ALONG HIGHWAY 68 AND NOW A SECTION OF HWY 641. The attached map shows the complete route. Even the weather and lower gas prices are smiling on this event. The weathermen say the temperatures will cool down into the low 80's during the Sale on Thursday and in the high 70’s on Friday and Saturday with clear skies. deal" or bought the "craziest thing". And yard sellers don't forget to advertise locally. Check out 400mile.com for more on the 400 Mile Sale, a list of participating communities and all the yard sale locations thus far signed up. May - "Garden Day" will be held May 12, 2012, from 10 a.m. until 5 p.m. See Schedule and Press Release below. "Garden Day" will be held May 12, 2012, from 10 a.m. until 5 p.m.
Free Trolley will be running for Visitor’s convenience. 10 – 4 Museums Open - Paxton Inn - Visit Garden and Artist in back - Flower Show 9:30-11:30 -Best Spring, Wild flower & Dried arrangement. 606-301-1832 to pre-register before May 10th may take home a free plant. In front of Washington Hall -Frosty Rankin - All 13 KY Covered Bridges, & Floral paintings for sale. 10:00 a.m. - 4:00 p.m. - Local garden and related vendors will be set up with displays and selling their wares. The Board is holding a Grand Reopening event with a tea and live music. who are sponsoring a new event this year in the historic 1700s village of Washington, Kentucky. Garden tours, artists, printmaking, plant and flower demonstrations, sales and even music and a “Tea” will highlight Garden Day on Saturday, May 12, 2012. All of the events are free and opened to the public. The Visitor’s Center and Museums will be open from 10:00 a.m. until 4:00 p.m. This is an all-volunteer program. The focus of this event is education while having a wonderful time celebrating the arrival of spring and Mother’s Day. in the Old Church Museum. will be transporting visitors up and down Old Main Street. two heirloom roses from the garden of Luellen Pyles’ grandmother and peonies, a favorite of the Marshall Key family. A shade garden beneath an old maple tree contains shade-loving plants: hostas, ferns, sweet woodruff, bee balm, germander and bleeding hearts. Beautiful tulips, donated by Jane Wise, were in bloom earlier in the season. It is in this picturesque setting artist Barb Clarke will be located. The Pillsbury House located at 505 South Court Street has flowering beds in front, hostas and flowers as well as flowering shrubs, and hollies along the side and back of the home built in 1812. The Angel Garden in the center of the back yard has just been completely renovated and knockout roses added. There is a fountain on the back in front of the wrought iron fence. A huge magnolia tree beside the grape arbor is the focal point of the back yard. 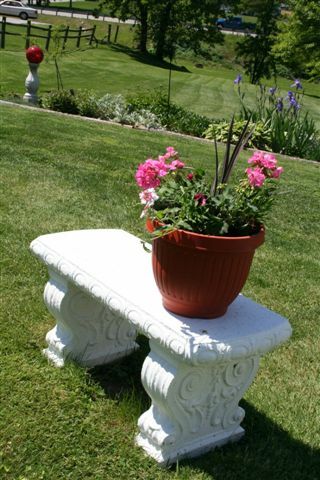 An electric antique birdbath, bird feeders, & sundial are found as you wander the winding rock and brick pathways around the yard. built by George Soward in 1847 had a traveler’s room”. The Bluegrass Artisan Center, 2215 Old Main Street is located in the Cane Brake log cabin, which previously housed the Visitor’s Center. Its’ garden features cane, peonies, lily of the valley and lamb’s ear. Mike Cowden, director, has filled it with local and regional art exhibits, Megann Thomas’ sculpture, and Sue Gorman’s paintings. Nearby Jeanine Gallagher's Greenhouse will set up with Jennifer Gleason’s Sunflower Sundries. Rob Weingartner will be demonstrating silversmithing designing his unique jewelry. ”Growing Herbs” with Carrie Taylor, MCTC instructor, will be held in the Washington Meetinghouse from 10:00 until 11:00 a.m. Free and all who call 606-301-1832 to pre-register can take home a free plant. 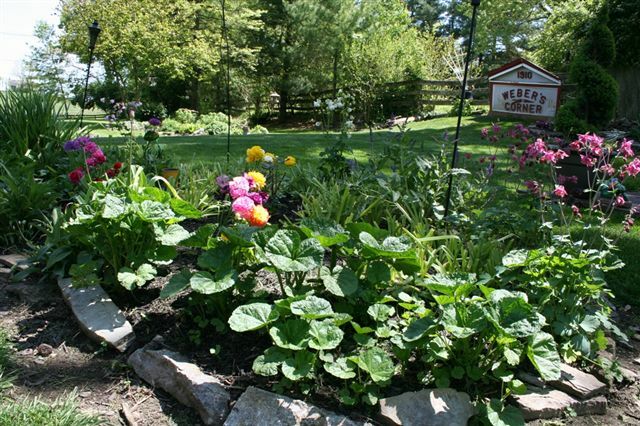 Mason County Extension Agent & Master Gardeners will have presentations at the Washington Meetinghouse on flower arranging and dividing plants from noon until 2:00 p.m.
Visit the Albert S. Johnston House Museum at 507 South Court Street and register for a door prize. Permanent village shops, artists, local garden and other vendors will be set up along Old Main Street with displays and selling their wares. 2127 Old Main Street: Daylilies, Magic Lilies, Irises, Egyptian onions, Berries, Concord Grapes plants. The Amish “Homestead Greenhouse” will be set up in front of the old Courthouse site. Frosty Rankin will have his paintings of all 13 Kentucky Covered Bridges as well as floral and others for sale in front of Washington Hall. 8 African Sulcata turtles, Green Wing Macaw “Sampson”, Fancy small bred chicken pets will be out to “Visit” weather permitting as well as many unusual perennial plants for sale. Food and drinks will be available at Paxton Inn. until 5:00 p.m. Live music and refreshments. A prize will be awarded for the Best Lady's Bonnet. When departing Washington be sure and visit beautiful Bellside Garden 3 miles west at 4158 Clarks Run Road. It has an English style garden with brick paths, many varieties of daylilies, Asiatic lilies, clematis, herbs, holly, iris, hydrangeas, a small fish pond, hay and hanging baskets and unique shade garden of hostas, ferns and container plants. Mary’s contrariness aside, gardening has a positive impact on both mental and physical health by relieving stress and lowering blood pressure. Growing things also lends a sense of self-determination people may not get elsewhere in their lives. A garden of any kind is something you own. Chocolate Festival – April 16-17, 2011 (24th Annual Event) Chocolate is found in the 1700s village shops located along flagstone streets during this award winning festival as well as vendors on the street – homemade candies, cakes, cookies, tons of fudge, Pageant, Horse-drawn Carriage Rides, Pirate Ship Ride, and various games all to make this a fun filled weekend. Outside setups $45.00 per 16 foot space for non-food and only $65.00 per 16 foot space for food. Woodcarver’s Day – June 11, 2006 (15th Annual). Woodcarvers from many states flock to this unique village to demonstrate their talents, sell their carvings and compete for ribbons in many different categories. "An Evening in Washington" - with Woody Wood's Big Band - August 24 - 6 pm until 8 pm. Come early and shop, visit the museums and pick up a box dinner in Washington or bring your own. Bring your lawn chair. To be held on the back lawn of the Harriett Beecher Stowe Slavery to Freedom Museum. For more information contact Duff Giffen 606-564-9419. Late Nite Shopping – Cancelled due to lack of interest - Dec. 6, 2007 (10th Annual). Shops stay open until 8:00 p.m. (starts right as shops usually close for the day), with some serving refreshments, and many services, lots of specials, new holiday items.